Education: Chengdu University of TCM, Master of Medicine, Doctor of Medicine (China), 1987, 1994. 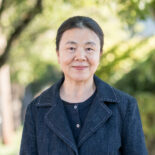 Dr. Xiaoli Chen’s practice is, for her, a calling. “Using Chinese Medicine to heal wounds, treat illness, and prevent diseases is my holy mission. My intention is to always practice with a kind heart.” With more than 25 years of clinical experience in China and the United States, Dr. Chen treats a wide range of conditions. Dr. Chen supervises interns on teaching and observation shifts at the NUNM Health Centers – Lair Hill. Her treatments include acupuncture (plum-blossom needling therapy, three-edge needling therapy), moxibustion (cupping therapy, gua sha therapy), herbs, diet, qigong, taiji, and Chinese massage. In addition, she practices privately at Kwan-yin Healing Arts Center in northwest Portland. Understanding the intimate relationship between nature, humans, and our health, Dr. Chen became interested in classical Chinese medicine’s holistic treatment approach because of its focus on the uniqueness of each individual’s condition. She studied and taught at Chengdu University of Traditional Chinese Medicine in China, where she received three degrees: Bachelor of Medicine in Chinese Medicine, Master of Medicine in Acupuncture, and Doctor of Medicine in Acupuncture. At NUNM, Dr. Chen teaches Acupuncture & Moxibustion Theory, Acupuncture & Moxibustion Techniques, Clinical Case Presentation, and Traditional Mentorship Tutorial. She has published three books: Chinese-English Clinical Moxibustion, Experimental Acupuncture Science, and Acupuncture and Immunology. She has also published extensively in professional journals and won several excellence awards for her doctoral thesis on the effects of small-corn moxibustion on the cellular immunity in rats with rheumatoid arthritis. As a chief researcher, she has participated in several studies including a case series on depression associated with menopause (2003-2005) and worked on a project through NUNM’s Helfgott Research Institute studying the effects of adjunctive acupuncture in the treatment of spasmodic dysphonia (a voice disorder). When she is not practicing, teaching, or researching, Dr. Chen enjoys Taiji and Qigong, hiking, gardening, and cooking traditional Chinese foods.